Hiiiiiii. You know what I’m excited to be talking about today. Eating healthy. Some people really get down on New Year’s resolutions and think it is arbitrary to make goals because it is a new time of year. But not me! Any indicator that gives us pause to reflect is good in my opinion. We are a go-go-go type society, always looking to check something off the to-do list, so if January 1st gives you a moment to pause and reflect, I say great! I know you and I both are seeing this month as a chance to up our healthy eating habits. When you let me know last week that you were looking to get a little more vegetarian with your diet, I got really excited. I like to think I’m not the type of person to push a vegetarian agenda. I actually don’t believe that there is one diet that is best for everyone. However, I do believe strongly that our current overall treatment of animals for meat and the impact on the environment needs changing. Also, most of the meat in the U.S. is currently full of unneeded antibiotics and hormones that just are not good for our bodies. I do think even lowering the amount of meat we each consume, along with being thoughtful about what type of meat we buy does have positive benefits on animals, the earth and our bodies. Sooooo, I’m thrilled that you want to up the veggies in your diet. More whole grains and vegetables has to be a good thing, right?! Of course, now I just want to bug you all the time with ideas of what to cook. I suppose looking at our massive amount of recipes on Pinterest could be helpful. But that’s a mix of recipes we like and recipes to try (I try to subtly delete recipes I’ve tried that didn’t click for me). Curried Cauiflower Soup by Cookie and Kate. Change one thing when you make this soup. Double it. 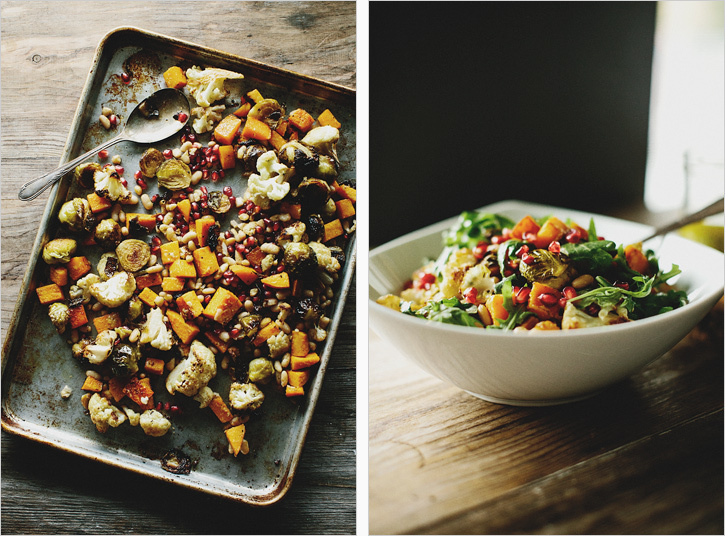 Autumn Salad with Horseradish Vinaigrette by Sprouted Kitchen. Ummmm, you had me at Horseradish. So many veggies, so much goodness. To Grandmother’s House We Go by Bon Appetit. Let’s not get too serious about eating healthy around here. 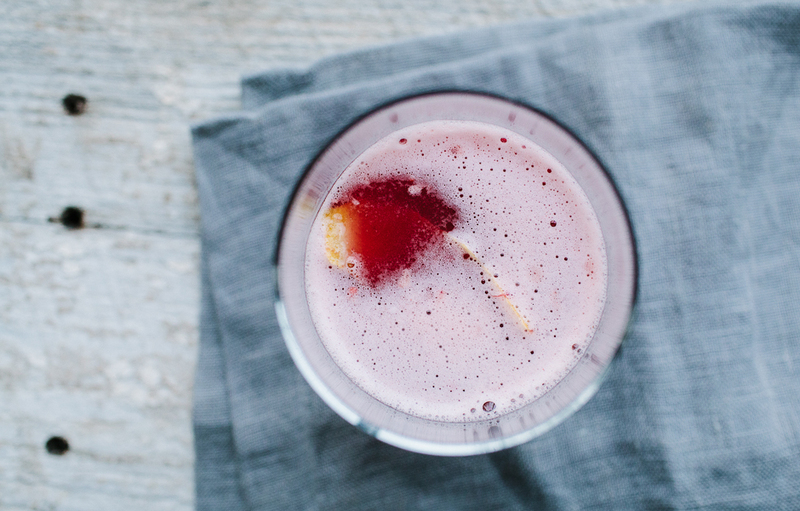 A good winter cocktail has its place. Honey-Lime Quiona Stuffed Sweet Potatoes by Cooking Classy. Sweet potatoes aren’t usually my jam, but I’m pushing what I like and the amount of spices and flavoring in this dish make it all worth it. But I know what you really want more of in your life. Easy, slow cooker vegetarian meals. To be honest when you first said that, I thought, hmmmm, don’t know too many of those. What else is there besides a million chilli recipes?! I did a little searching on Food Gawker and turns out there are a lot of creative, vegetarian slower cooker ideas out there! So many in fact I had to make a Pinterest board about it (of course I did!). First of all, there are a lot of interesting soup recipes. Greek soup. African Peanut Soup. Quinoa Corn Chowder. Feeling pretty strong that you should try making this onion, beer soup with one of Dale’s homemade beers. But it turns out the slow cooker can be about more than just soup for the vegetarian. Lasagna loaded with vegetables. Vegan Saag Paneer. Lentil Quinoa Taco Filling. You can make tofu dishes in a slower cooker? Whaaaat? Thai Salad with Slow-Cooked Tofu in Pineapple Barbecue Sauce. Slow Cooker Coconut Tofu Basil. And the thing I think you should try this week. Breakfast for dinner in the slow cooker. Frittatas! What good for you meal has everyone else been out there cooking?